A well-designed comprehensive assessment system includes many different types of assessment serving the needs of students from preschool to the 12th grade. The various assessment types serve different purposes and provide many benefits. ATI’s comprehensive assessment system includes benchmark, formative, screening and placement tests, plus interim and final course examinations, pretests and posttests, computerized adaptive tests, and instruments documenting instructional effectiveness. Perhaps the most important benefit of a comprehensive assessment system is that it supports the ability to adapt to continuous change. Comprehensive assessment systems hold the promise of providing beneficial changes in the ways in which assessment is used in education. Perhaps the most significant change is the increase that a comprehensive system can provide in the amount of information available to improve education. • In a comprehensive system, results from a variety of assessments can be placed on a common scale. The use of a common scale makes is possible to directly compare results from different assessments, offering a more complete picture of academic accomplishments. • A comprehensive assessment system can also increase assessment efficiency. In ATI’s comprehensive system, a technology platform common across assessment types is developed to facilitate implementation of the system. The platform includes artificial intelligence routines that guide the construction, review, publication, security, scheduling, administration, and scoring of tests, plus psychometric analyses, reporting, and the provision of actionable decision options. • A comprehensive system also provides system monitoring tools that make it possible to guide system implementation. These tools include information regarding when tests have been constructed, reviewed, revised, and delivered. Monitoring information also provides data on the extent to which different types of assessment are used. This information can be used to guide the development and refinement of a comprehensive customized assessment strategy. View ATI’s White Paper on Comprehensive Assessment. This white paper, prepared by ATI, gives a more detailed discussion of the major types of assessments included in a comprehensive system, the purposes of each type of assessment, and the characteristics and procedures required to ensure the effective implementation of each type of assessment. • People have separate auditory and visual channels. • These channels are limited in capacity. • Meaningful learning involves actively selecting, organizing, and integrating incoming visual and auditory information. So, how do we get all this information into and understood by these channels? Well, there are 12 principles to consider which break down into three types - principles that reduce extraneous processing, principles that manage essential processing, and principles that foster generative processing. • Coherence Principle - People learn better with extraneous works, pictures and sounds are excluded rather than included. • Signaling Principle - People learn better when cues that highlight the organization of the essential material are added. • Redundancy Principle - People learn better from graphics and narration that from graphics, narration and onscreen text. • Spatial contiguity Principle - People learn better when corresponding words and pictures are presented near rather than far from each other on the page or screen. • Temporal Contiguity Principle - People learn better when corresponding words and pictures are presented simultaneously rather than successively. • Segmenting Principle - People learn better when a multimedia lesson is presented in user-paced segments rather than as a continuous unit. • Pre-training Principle - People learn better from a multimedia lesson when they know the names and characteristics of the main concepts. • Modality Principle - People learn better from graphics and narration than from graphics and on-screen text. • Multimedia Principle - People learn better from words and pictures than from words alone. • Personalization Principle - People learn better from multimedia lessons when words are in a conversational style rather than a formal style. • Voice Principle - People learn better when the narration in multimedia is spoken in a friendly human voice rather than a machine voice. • Image Principle - People do not necessarily learn better from a multimedia lesson when the speakers’ image is added to the screen. Wow, that’s a lot of principles. These shouldn’t be viewed as a formula, but as recommendations to think about when creating multimedia presentations. 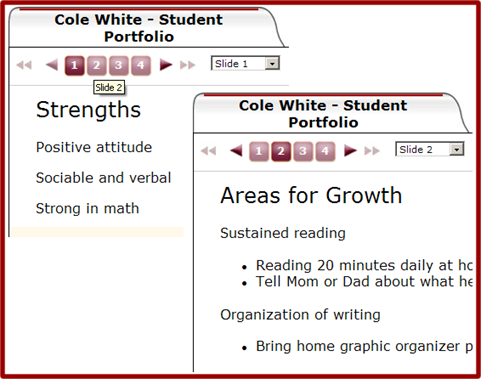 ATI multimedia presentations in both Instructional Dialogs and assessment items have been built with these principles in mind. Did you realize that Galileo technology is the first and most extensively integrated research-based online educational management system currently used in Head Start and other early childhood programs? Galileo Plus with Merlin supports a collaborative, data-driven, and goal-directed approach to promoting positive child outcomes. Coming this summer: Galileo’s G3 Assessment Scales with fully integrated curriculum and reporting system directly articulated to the Head Start Child Development and Early Learning Framework. Galileo is designed to facilitate a program-wide, systemic approach to local decision-making and action in leading to positive outcomes for children. •you can visit us at the 38th National Head Start Training Conference April 4 through 8 at the Kansas City Convention Center in Kansas City, Missouri and/or at the Florida Head Start Training Conference April 25-29 at the Hilton Miami in Miami, Florida. We look forward to communicating with you online or at the events.